In a related area, the so-called " core punch" tactic, in which a Spotter drives through the storm core to reach the wall cloud and tornado region, is not an advisable intercept strategy. The Net Controller should never ask a spotter to engage in a core punch, but it might happen inadvertently. If it should appear that the Net Controller is asking a Spotter to do a core punch, they should inform him / her immediately of what he / she appears to be asking them to do. Get a clarification on the information given, and remember that the Spotters have the right to refuse to engage in what they consider to be unsafe activities. If we are to err, it always should be on the side of safety! High winds also can pose problems, especially when accompanied by hail and/or heavy rain. Potentially damaging objects can be carried by the wind. 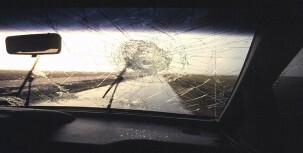 Wind-borne dust can reduce visibility to near zero and vehicles literally can be blown off the road. It is inevitable that SKYWARN Spotters will encounter strong winds during severe wx events, but the Spotters need to be alert to the potential for serious damage. It often appears that seeking shelter from the wind in the lee of a building is a good strategy, but it can backfire if the building is a flimsy one. Pieces of the building may fly off and strike a vehicle parked nearby, so if seeking shelter from the wind, be sure the shelter is not going to be a potential problem. In strong winds, be very careful when opening your car door... the wind can rip the door from your grasp and spring the hinges, damaging the vehicle and potentially injuring someone standing nearby. Vehicle drivers are admonished to keep their attention on driving at all times when the vehicle is moving. Driving is a full-time job and this is no time for rubbernecking at the storms. At no time should the drivers be responsible for anything other than driving while the vehicle is moving. Yes, this means get a spotting or chasing partner!